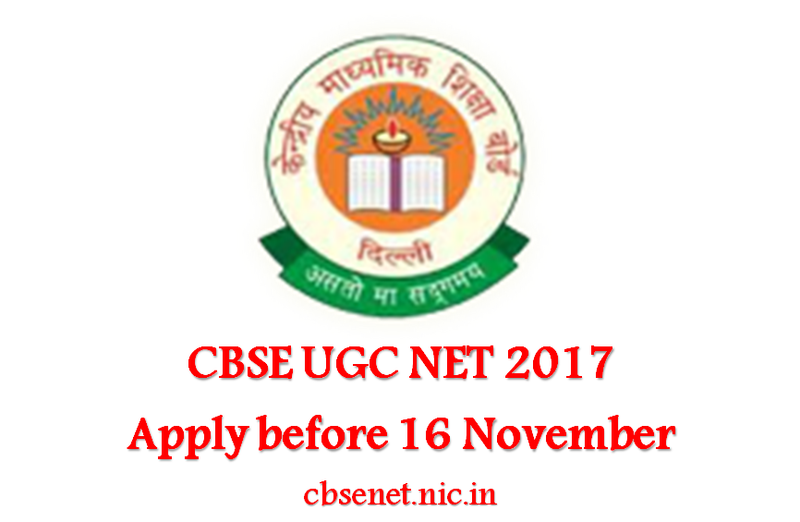 With only 02 days left aspirants should submit their applications for CBSE UGC NET 2017 as soon as possible! On behalf of UGC, CBSE will conduct NET on 22 January 2017 for selection of Assistant Professor only or JRF & Assistant Professor. The exam will be held at 90 cities of the country in 84 subjects. Candidates should note that the award of JRF and Eligibility for Assistant Professor both OR Eligibility for Assistant Professor only will depend on the performance of the candidate in all three papers of NET. However, the candidates qualifying exclusively for Assistant Professor will not be considered for award of JRF. Candidates who have secured at least 55% marks (without rounding off) in Master’s Degree OR equivalent examination from universities/institutions recognised by UGC are eligible. Candidates who have appeared OR will be appearing at the qualifying Master’s degree (final year) examination and whose result is still awaited or candidates whose qualifying examinations have been delayed may also apply for this test. However, such candidates will be admitted provisionally and shall be considered eligible for award of Junior Research Fellowship/eligibility for Assistant professor only after they have passed their Master’s Degree examination OR equivalent with at least 55% marks(50% marks in case of OBC(Non- creamy layer)/SC/ST/PWD(persons with disability) category candidates. Such candidates must complete their P.G degree examination within two years from the date of NET result with required percentage of marks, failing which they shall be treated as disqualified. The Ph.D. degree holders whose Master’s level examination had been completed by 19th September 1991(irrespective of date of declaration of result) shall be eligible for a relaxation of 5% in aggregate marks (i.e. from 55% to 50%) for appearing in NET. iv) Candidates are advised to appear in the subject of their post graduation only. The candidates, whose post graduation subject is not covered in the list of subjects mentioned by UGC may appear in a related subject. Candidates applying for JRF must not be more than 28 years. However there’s no age limit for Assistant Professor post. A merit list will then be prepared subject-wise and category-wise using the aggregate marks of all the three papers secured by such candidates. Top 15% candidates (for each subject and category), from the merit list will be declared NET qualified for eligibility for Assistant Professor only. Selection criteria adopted for JRF, is a bit different. Given below is the selection procedure for General category, similar formula will be used for OBC/SC/ST category and all the subjects. Interested candidates should be well versed with the exam pattern of CBSE UGC NET 2017. The test will be of objective type and will comprise of three papers. All the questions of Paper – II and Paper – III will be compulsory, covering entire syllabus (including all electives, without options). The candidate will have to mark the responses for questions of Paper – I, Paper - II and Paper – III on the Optical Mark Reader (OMR) Sheet provided along with the test booklet. Candidates qualifying for the award of Junior Research fellowship will be eligible to receive fellowship of UGC under various schemes, subject to their finding placement in universities/IITs/institutions. The validity period of the offer is two years w.e.f. the date of issue of JRF Award Letter. However, in case the candidates who have already joined M. Phil./ Ph.D., the date of commencement of fellowship shall be from the date of declaration of NET result or date of their joining, whichever is later. NET/SLET/SET shall remain the minimum eligibility condition for recruitment and appointment of Assistant Professors in Universities/Colleges/ Institutions. Provided however, that candidates, who are or have been awarded a Ph. D. Degree in accordance with the University Grants Commission (Minimum Standards and Procedure for Award of the Ph. D. Degree) Regulations, 2009, shall be exempted from the requirement of the minimum eligibility condition of NET/SELT/SET for recruitment and appointment of Assistant Professor or equivalent positions in Universities/ Colleges/ Institutions. The candidates who have passed the UGC/CSIR JRF examination prior to 1989 are exempted from appearing in NET. The candidates, who have cleared the States Eligibility Test (SET) accredited by UGC for eligibility for Assistant Professor held prior to 01 June 2002, are exempted from appearing in NET, being eligible to apply for Assistant Professor anywhere in India. For SET held from 01 June 2002 onwards, the qualified candidates are eligible to apply for the post of Assistant Professor only in the universities/ colleges situated in the state from where they have cleared their SET. How to Apply for CBSE UGC NET 2017? Candidates must apply online. Before applying Online, the candidates must possess the scanned images as below, Passport size photograph in JPG format of minimum 4kb to 40 kb. The dimension of the photograph should be 3.5 cm (width) x 4.5 cm (height), Signature in JPG format of minimum 4kb to 30 kb. The dimension of the signature should be 3.5 cm (width) x 1.5 cm (height). After filling all the details for applying online for NET the candidates have to select the option of payment of examination fee either by credit/debit card or through e-challan generated during the online filling of the application form indicating the details therein.